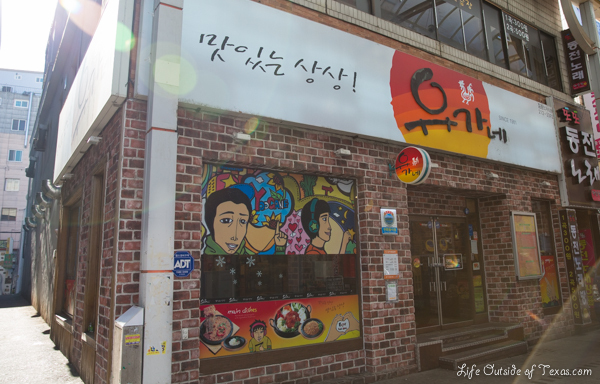 Yoogane (유가네), pronounced Yoo-ga-neh, is a chain restaurant in Korea that specializes in dak galbi (닭갈비: spicy stir-fried chicken). Yoogane is a favorite among foreigners and Koreans alike. 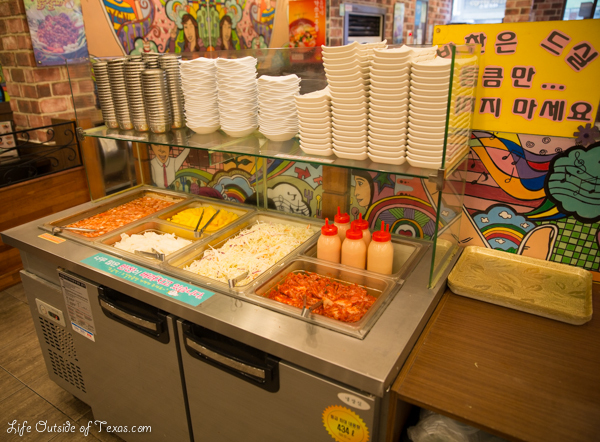 It’s especially great for people just beginning to eat Korean food because the menu is in English and there aren’t an overwhelming amount of choices. Also, you’re sure to see some things on the menu you’re familiar with, like fried rice and ramen noodles. I always bring my friends that are visiting Korea here because it’s a nice, easy transition into Korean food. It’s also pretty inexpensive and very tasty! 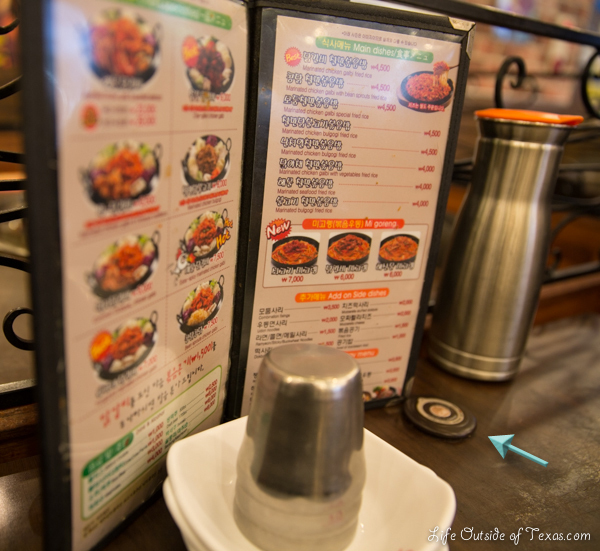 Click the photos above to see the full sized menu photos. The prices listed are per portion. Note: You can typically get away with one less portion than the number of people at the table (so 3 portions per 4 people), but only you know your appetite so order accordingly. You can also select some add ons from the “Add on Side dishes” menu. 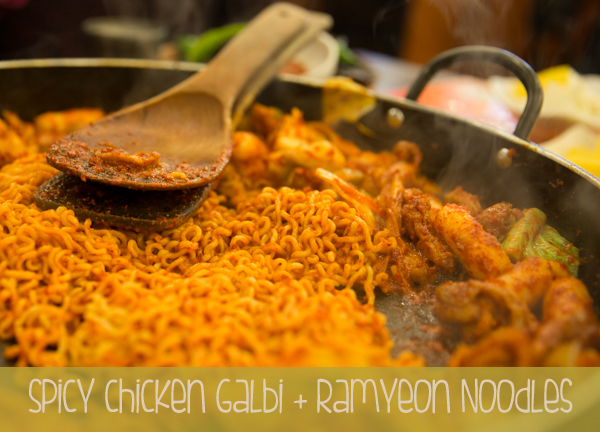 I typically add ramyeon (ramen noodles – pronounced ra-myun) and cheese dokboki. This dish is fine all on its own, but you can ask for cheese when ordering if you want to take it to the next level. It’s also great with cheese dokboki. When you’re ready to order, push the call button on your table and someone will come over to help you. While you’re waiting for your food, you can help yourself to the salad bar. 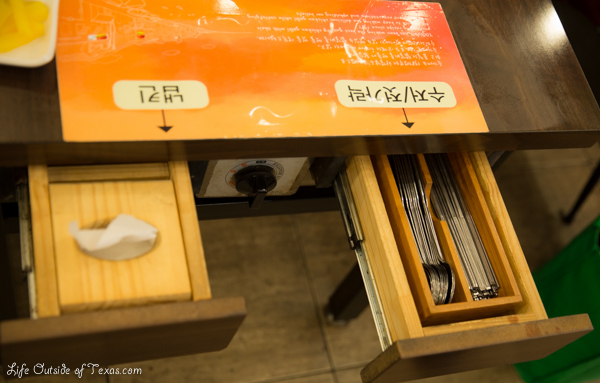 Napkins and silverware (chopsticks and spoons only) are located in the drawers at the end of your table. If you’re still trying to perfect your chopstick skills, don’t feel shy about bringing a fork along, or you could always try asking for one by saying, “Poke-uh issuh-yo?”. The food will be cooked at the table in front of you by a Yoogane staff member so you can sit back and enjoy the company of your friends and the smell of the food. Yoogane is located along the main covered walking street in Shinae / Seongnam-dong (on the left side) and all across Korea. If you try it, be sure to let me know what you thought by commenting below. Please LIKE US on Facebook for more about life in Korea. 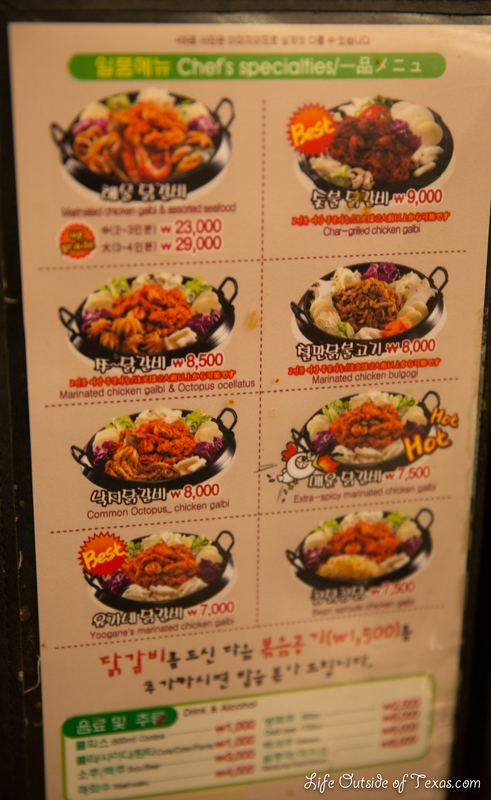 This entry was posted in Old Downtown Guide, Restaurant Guide, Ulsan Expat Guide and tagged best korean food, chicken galbi, galbi korean bbq, korean food menu, korean foods, living in Ulsan, ulsan food, ulsan restaurant review, yoogane chicken galbi, yuganae chicken by Meagan & Dave | HappilyEverExpat.com. Bookmark the permalink. Yum! 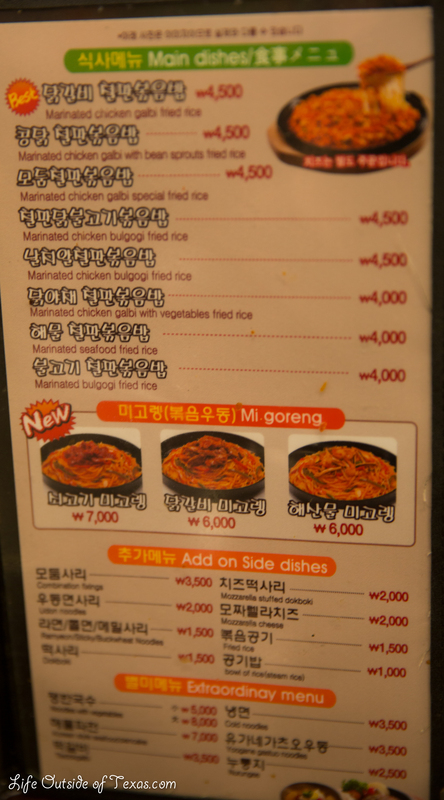 How great that you have an “intro” for Korean foods! Dang! You are a good ways outside of Texas! By the way, I freaking love Kim Chi! That’s right. Just celebrated my 3rd year anniversary of living in Korea. Kimchi is pretty tasty. I love it too. Thanks for stopping by and commenting! We used to love that place!